Harmony contains a camera that can move along the X, Y, and Z axes. Having the camera move on the Z-axis offers the possibility to create truck in and truck outs, as well as multiplane camera moves. 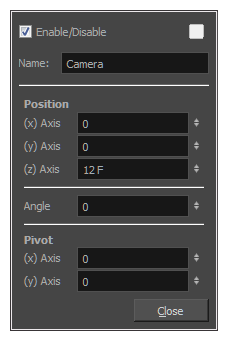 The default camera position is centred and backed up to 12 fields. It is important to understand the coordinate values in Harmony, which is based on the origins of animation. 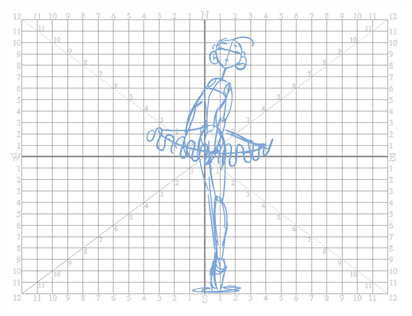 In traditional animation, a scene's size and camera motion are calculated in fields. A field has a 4:3 ratio and measures 0.5 inches (12.7 mm) in width. A specific grid has been created for this purpose known as a field chart. Harmony uses this unit of measurement as its coordinate system. A field chart uses the cardinal directions. The X axis is the east-west (left-right) direction, the Y axis is the north-south (up-down) direction and the Z axis is the forward-backward direction. The scene action occurs inside the camera frame, so it’s really important to set it up correctly. You can adjust the camera resolution and other parameters in the Scene Settings window—see About Scene Settings. By default, a scene does not have a camera layer. In order to be able to tweak the camera's angle and position, you must add one to your scene. Although it is possible to have several cameras in the same scene, you can only view your scene using one camera at a time. This can be useful if you are still working on your scene composition and have different camera framing to try out. The Camera layer is static which means that if you need to animate it, you must put it under a parent peg—see Animating the Camera. You can reposition your camera frame directly in the Camera view, using the advanced animation tools. Another way to set up your camera frame is to type the coordinates directly in the camera's properties. Doing this positions the camera precisely where you want it to be rather than gauging it visually—see Positioning Elements with the Layer Properties View.